As I’ve previously written, I’m challenging myself to practice yoga at least once a week at Funky Door Yoga on Polk Street. I started the challenge nearly a month ago and have been consistent in making it to a 6am class once a week. The good: I’ve found myself relaxing more during the class instead of counting down postures or watching the clock. Bikram is a very Type A style yoga – it’s challenging, lacking thrills, and, most important of all, it’s consistent and unchanging. For someone who multitasks like crazy, obsesses over punctuality, and can be wound a little too tightly sometimes, a yoga style that panders to my more intense characteristics may not be the best type of yoga for calming my mind. However, I do find myself relaxing into the postures and accepting the ones I dislike the most (half moon post with hands to feet), knowing that they are ultimately good for me. It’s a bit sisyphusian in a way, knowing that this posture will come back to haunt me twice during every class, and I’ve come to embrace the pain (much like I do during miles 22-26 of a marathon). I hate this pose. Courtesy of Sombilon Art Media and Photography. I feel more flexible in areas where I was losing flexibility, namely my back and hamstrings. I’ve also improved at some of the postures: in standing head to knee, I can sometimes lock my knee so I can bring my upper body down around my lifted leg. The bad: I wish Bikram had more hip stretches and shoulder stretches. I get a little sick of the same postures every time, and I would check out another studio, but it’s so logistically challenging on multiple levels. Unless your gym has a great yoga class at a convenient time, investing in classes at a yoga studio is expensive. Funky Door is the cheapest place I’ve found and it’s close enough to my apartment, but it’s definitely not the best studio I’ve frequented. Another logistical problem is hauling all the gear necessary to go to yoga in the morning. In two bags, I walk with a yoga mat, two towels, my toiletires, my outfit for work, and the typical contents on my purse. Walking for almost 1.5 miles with this stuff hanging on my shoulders is uncomfortable, and I can’t help but think about how it’s negating the posture work done in yoga. The ugly: The yoga studio’s locker room is laughably small. Two showers, a corner of locker rooms, and a mirror are meant to serve the dozen plus women who use the facilities post-class. Also, the distinctive odor (and trust me, it’s not Chanel No. 5) that greets you when you open the door at 6am is enough to make me lose my nonexistent lunch. I’ll do another recap of the whole challenge when my 10 classes are complete. Namaste. 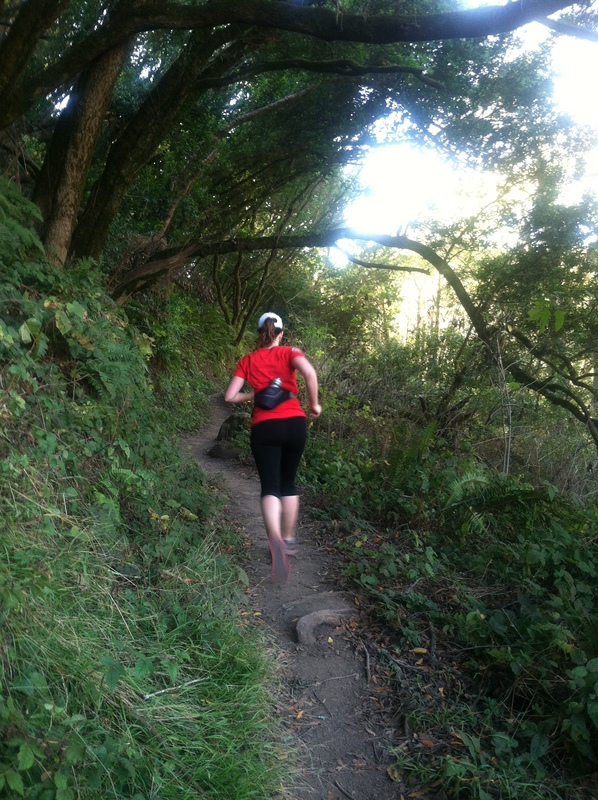 I’m trying to get more flexible so I can generate more power while running uphill. I also try to go to yoga once a week to help my running. And yes, I do find that the more I do it, the easier it is to relax my body and mind. When I miss a class, I can tell a difference.